Bronx Country Chorus Presents Disney Dazzle! 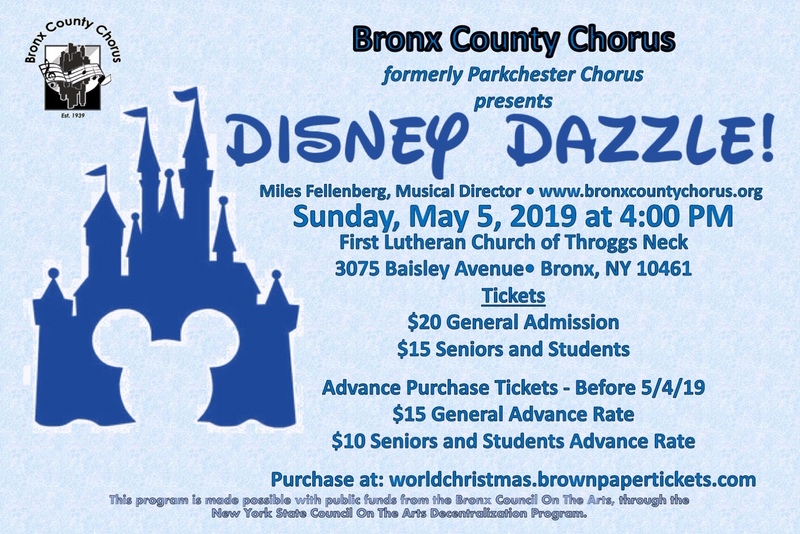 With musical salutes to the world of Disney, Bronx County Chorus brings you “Disney Dazzle”, Sunday, May 5th at 4 p.m. at First Lutheran Church of Throggs Neck. Come, relax, remember and enjoy, be part of the audience, and be entertained by Bronx County Chorus at their spring semester 2019 concert. Hear many choral numbers and solos from old and very new Disney works: “Alice in Wonderland”, and “Cinderella” to “Lion King”, “Moana”, “Mary Poppins”, and “Aladdin”. Additionally, the program includes groups of songs from, “The Little Mermaid”, “Snow White”, “Pinocchio”, and “Beauty and the Beast”. Then there are the bunch of stand-alone songs like, “Small World” “I’ve Got No Strings”, “Zip-a-dee-doo-dah”, that you find yourself singing as you go about your life. The spring 2019 program is truly a montage of well-known Disney songs sung by chorus members, and chosen by director, Miles Fellenberg, and assistant director, Christian Aquino. “Neverland” with Bronx County Chorus awaits you May 5th 2019. Bronx County Chorus, the oldest ecumenical chorus in the Bronx, with 79 years of Bronx residency, has a history of musical diversity. Our well received winter program consisted of holiday music celebrating the winter holiday experience. Bronx County Chorus (BCC) formerly Parkchester Chorus, is a not-for-profit 501(c)3 organization. It is supported by the Bronx Council on the Arts. Membership is open to all twice a year, once in September and at the opening of the second semester in January. Uniquely, members are of all ages and backgrounds and members come from all-over the Bronx and Westchester. Rehearsals are held weekly on Mondays, from 7:30 – 9:30 PM, at First Lutheran Church of Throggs Neck, 3075 Baisley Avenue, Bronx 10461. Plus, once a month, Sunday afternoon rehearsals are held at First Lutheran Church. Semester fees are $40 per person, $60 per couple and a $10 – $20 per person music fee. Bronx County Chorus web site address is: http://www.bronxcountychorus.org/. For more information please write: info@bronxcountychorus.org . By bus, you can access the First Lutheran Church by the Q50 or Bx5 bus from Pelham Bay Station. By car, a left turn from Tremont Avenue going east, over Crosby to Baisley, will get you there. Street parking is available. For further information call: 1-718-320-2790, and please leave a message.